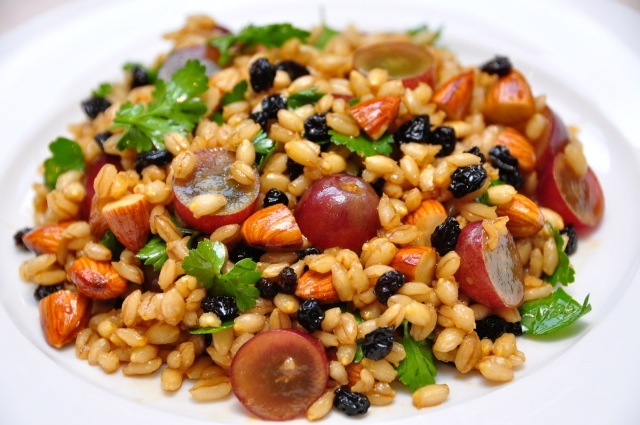 The sweet Vino Cotto raisins are delicious in this healthy pearl barley salad with a nutty gourmet crunch. Love the different textures this salad has to offer. This salad goes well with char-grilled chicken tenderloins or quails brushed with oil and vino cotto. Soak raisins in a bowl with Vino Cotto and set aside for 20 minutes. Place barley in a saucepan with 2 cups of water, bay leaf and 1 tsp of salt. Bring to the boil, reduce heat and simmer until barley is cooked or puffed up, approx.. 20 minutes. Stir occasionally. May need to add more water as it absorbs. In the meantime, place the cut grapes in a bowl and add the verjuice, stir, set aside. Drain cooked barley and place on a plate, drizzle with olive oil, mix through and allow to cool at room temperature. Transfer cooled barley to a bowl and add raisins, almonds, parsley and a few cut grapes. Add any remaining Vino Cotto from the raisin’s bowl to the salad. Mix thoroughly and season to taste. Add more olive oil if required. Just prior to serving, place barley salad in a serving plate and top with grapes. Drizzle with extra olive oil and little Vino Cotto.